The mail provider that handles our newsletter had some difficulty with graphics, so the original mailing didn't display many of the images. This mailing corrects that - apologies for the duplicate mailing. Merry Christmas to you and yours! Wishing all of you the Merriest Christmas and Happiest New Year! December fell in Tucson like water hitting fire, temperature plunging as the sun hid behind mountains. The threatened rain stayed in overhanging grey clouds, changing to nightly fog, heavy and thick, leaving the air wet and chilling the bones. Men, hardened to scorching desert air, ached with the cold. “I’d rather face July and August put together,” Joe Butler complained, coughing so hard he dropped a card on the bunkhouse floor. “Stop whining and make your bet,” Sam griped, eyeing his brother between swallows of whiskey. “I do not cough,” Joe growled, pushing his dollars into the growing pile in the center of the table. He attempted to stifle the next explosion, cleared his throat loudly to mask the sound. 1) Henry Darrow's 45 record of Little Green Apples and El Rancho Grande. If you've already paid in full then contact us - Out West Entertainment has a half-price offer for you on these CDs. 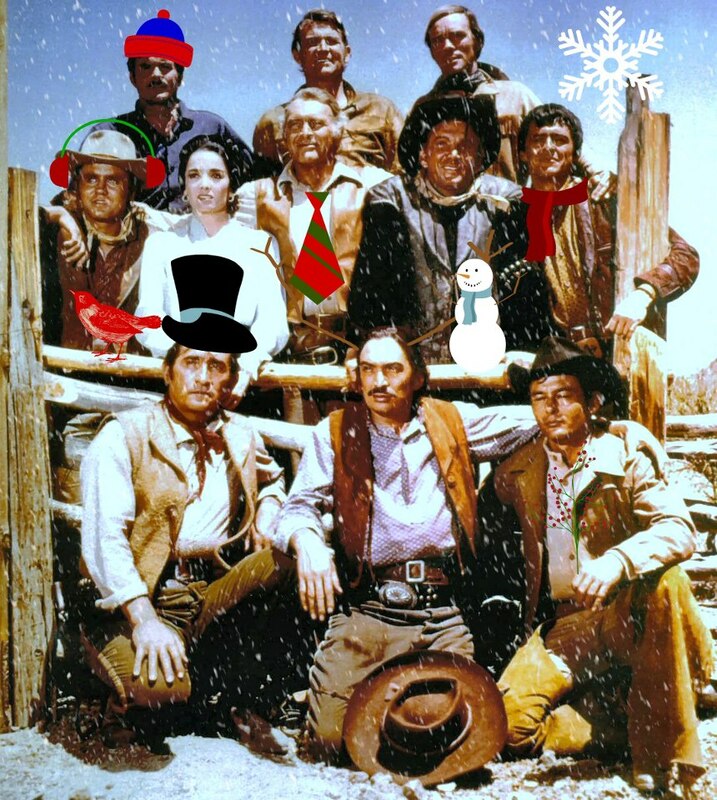 This could be the best thing under your tree – CDs & a trip to The High Chaparral. So many fans and Chaparral stars have registered, the number goes up weekly. Today we're at 60, headed quickly for 100 in attendance in March. 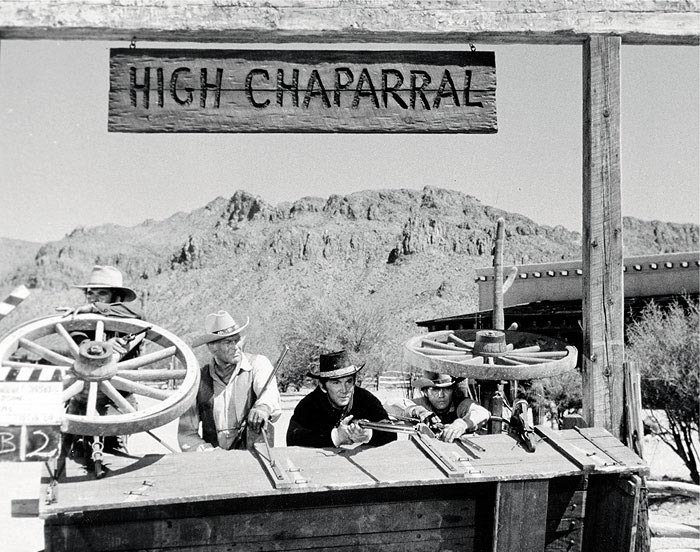 Be a part of the party, join us on The High Chaparral! If you aren't in the bunkhouse on Facebook, you're missing all the fun! All kinds of Chaparral pictures, photos, fan memories, stories about visiting the set, meeting the stars, memorabilia, videos - you name it, we're having HC fun. You'll meet other Chaparral fans, learn a few things, and see something new almost every day. If you aren't Facebook savvy you don't have to do anything but lurk and enjoy, or take the time to join, LIKE and comment. It's where the action is. WHEN Cameron Mitchell comes out flatly and says he thinks NBC-TVs now cowboy-and- Indian series. 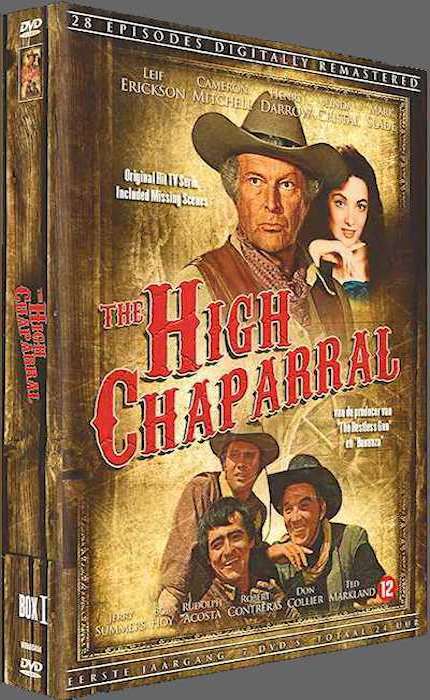 "The High Chaparral." will be a good one you'd better listen. The free-swinging. outspoken Cameron can tick off on one hand's fingers the roles he's done that he likes. “ 'Carousel' ? 'Carousel' was Just dreadful." he told me while practicing chip shots in his Regency hotel suite. 'Death of a Salesman?' I thought it was a flop on film; such a shame, because it was so good on Broadway. And listen I made 11 lot of movies in Europe that were among the worst ever produced anywhere." The stocky, athletic actor still has an unsigned contract from baseball's Detroit Tigers. Mitchell, thus, has extremely high standards for himself. He thought a while and came up with two performances he didn't mind: "Parts of ‘Monkey on My Back.' the Barney Ross picture, were good. 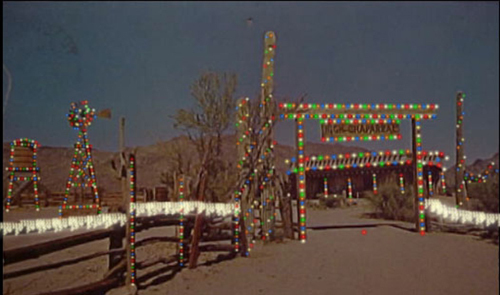 And I just finished a low-budget western. 'Ride in the Whirlwind.' that 1 think ought to be up for some awards. It'll be out in the late fall or winter and it's a good one." Anthropologists tell us man is supposed to be complex, not just a simple animal, and Cameron fits into their image. His whole world isn't acting. "I spent some time in a Zen monastery in Japan." he said, "and who knows if I hadn't become an actor, I might have been a holy man. 1 come from a long line of Pennsylvania ministers. "But I'm like all humans, I guess--victimized by my own bad habits, like smoking too much. I got used to a good, easy material life and with a family to support. I don't see how I can change. But holy men do inspire me. Gosh, can you imagine a modern, average man spending 40 days and nights in the wilderness?" Candor is Cameron's middle name, has been most of his life. When he came to New York before World War II from Dallastown. Pa., working as an usher, mail clerk. dishwasher and Radio City sightseeing guide with another unknown, Gregory Peck, he went to see the Lunts act one night and promptly wrote them a letter criticizing their work. "Their secretary told me to come see her." he smiled, "and boy, did she bawl me out. But she let me audition for her and I did a serious scene and reduced her to tears. The next night I auditioned for the Lunts themselves -and won a part in their 'The Taming of the Shrew.' which was my big break. Would I write a letter like that now? I doubt it. I'm aware now that it was a damned audacious thing to do." Mitchell is blunt about almost everything. He mentioned some movie directors he thought were simply awful- big-name directors—and he said there were no two ways about it, movies cost too much to make these days. "I feel sorry for most producers, whose hands are tied in so many ways.' he said. "They can't do this or that, for fear of offending different blocs and groups." 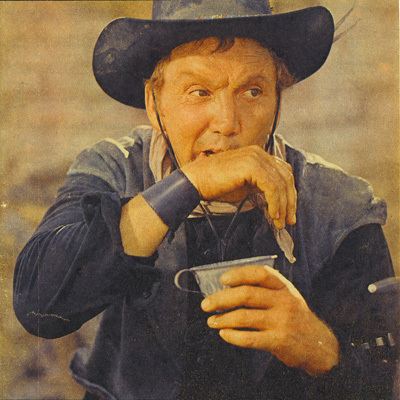 In "High Chaparral," he plays Buck "a lovely, amiable, active bum" --and he says that Mark Slade. who plays his nephew in the series, can't miss stardom. An old Indian aficionado, Mitchell's happy that "Chaparral" makes Indians out more heroes than villains. "What about that new series on ABC about General Custer?" he demanded, gloweringly. "How can they set that guy up on a pedestal? He was one of the most miserable men of our times, who used to kill women and children - and you know, that was how he lost out, finally, when the Indians baited a trap for him with women and kids." Mr. Mitchell swings from the heels. If he says his new show is good, pay a little attention. He might belt you if you don't. Did you remember to tell Santa what you want for Christmas? Chaparral Santa says Merry Christmas to all the High Chaparral family - that means you! Fans Jore and Andriana write from Mexico to share their experiences. 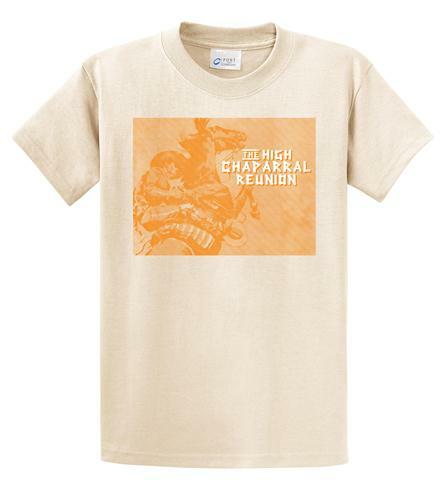 The High Chaparral fan family stretches around the world! Everything hit me, I could not believe I was in Tucson AZ with the players and organizers, and talk to them in this series so many stories of life showed us in every episode. The warm hospitality of you all made us feel at home. The live these days with fans from other countries moved me. Since we met people we create bonds of friendship. 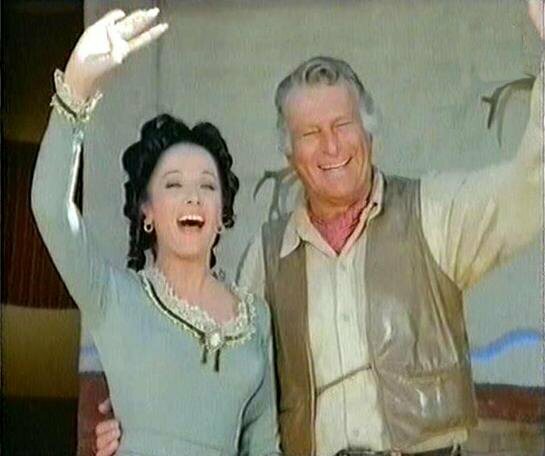 The sharing and exchanging comments about the episodes, characters, visiting and admiring at Old Tucson Studios, the home of the Cannons with the stunning landscape of mountains and desert with its majestic desert vegetation around San Xavier Mission, is something that is priceless and I will never forget. I remember with joy and yet these days with nostalgia. Goodbye to you and sending you greetings from Mexico. Todo me impactó, no podía creer que estaba en Tucson AZ con los protagonistas y organizadores, y el conversar con ellos de esta serie que tantas historias de vida nos presentaba en cada episodio. El trato hospitalario de todos ustedes nos hizo sentir como en casa. El convivir estos días con fans de otros países me emocionó pues conocimos personas con las que creamos vínculos de amistad. 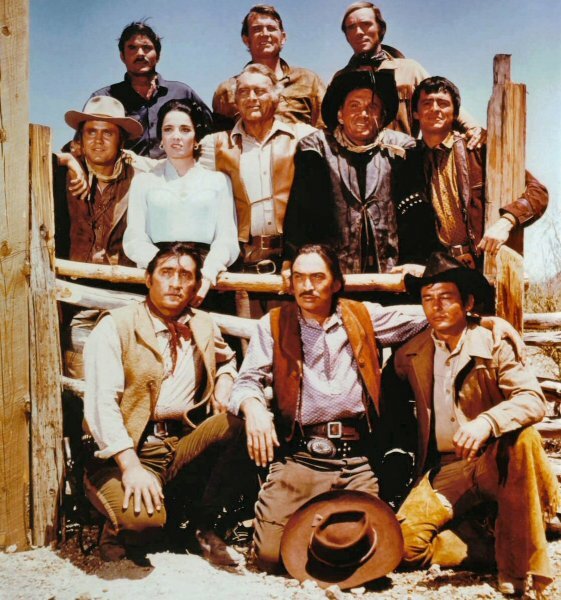 El compartir e intercambiar comentarios acerca de los episodios, de los personajes, visitar y admirar en Old Tucson Studios, la casa de los Cannon con ese paisaje imponente de montañas y desierto con su majestuosa vegetación desértica alrededor, la Misión de San Xavier, es algo que no tiene precio y nunca olvidare. Recuerdo con alegría y a la vez con nostalgia estos días. Se despiden de usted y enviándole un saludo desde México. (TUCSON, AZ) Old Tucson is pleased to announce that principal photography on a new western feature film, HOT BATH-STIFF DRINK, will begin on January 14, 2013 at Old Tucson. We are down to only 10 copies left and don't plan to order any more Season One! The DVD set only is $65.00 plus shipping, this is approximately what you would pay ordering from the Netherlands with foreign conversion/shipping. Season Two will ship at the end of January, pre-order now for earliest delivery. 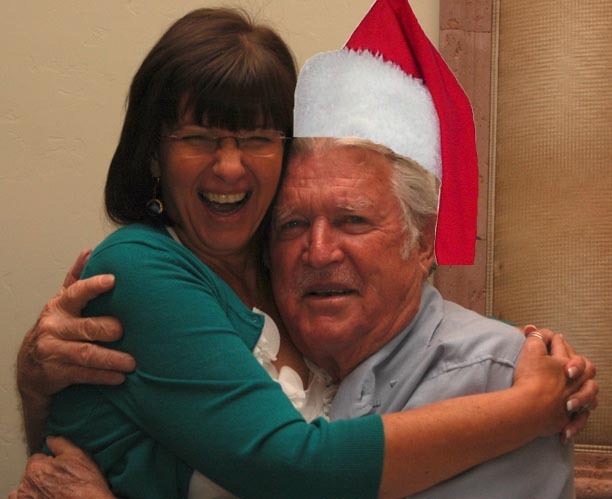 Thanks to Ginny Shook for adding Christmas cheer to the Chaparral crew in this and other photos. Not a tumbleweed rustled, nor a leaf on a branch. and they danced around gently in the warm night air. Like owning their own spreads and living like kings. While visions of beef herds grazed in John’s head. and of John in a suit and a blue silk cravat. Yes, the ranch was so quiet this calm Christmas Eve. But something would happen John couldn’t perceive. He was met by the sounds of a Western guitar. John thought that the dark had played tricks on his eyes. For there in the hay sat St Nicholas - life size! with large branching antlers, were eight big reindeer. ‘What’s this?’ asked Big John, ‘Surely this can’t be true? ‘Just needed a rest for the deer and myself. It’s tough work doing Christmas when you travel alone. ‘I could sure use a hand. Hey, what do you think? Help me do the last stretch - we’ll be done in a blink. Time waits while we work and flying is fun! ‘What! 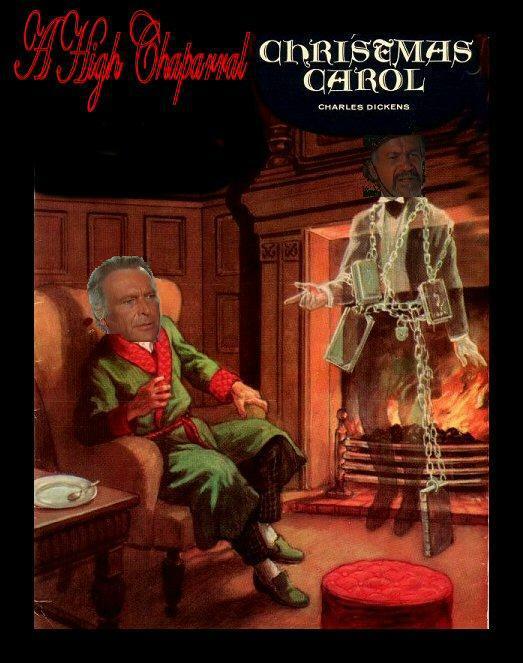 Fly in a sleigh,’ said Big John with surprise. ‘In the future,’ said Santa, ‘most people will fly. In a flash they were off – and that sleigh wasn’t slow! While John spoke of his struggles with life on the range. ‘There’s a lot to be done, I don’t get much sleep. I’d like a new bull, but good stock isn’t cheap. Equipment breaks down, there are wages to pay. dropping presents in houses of people John knew. ‘I’d like to expand, to have something to sell. the sweetest, the finest, a cut above the rest. where they left her some money and filled the coal sack. canned goods and flour, and a big cob of bread. ‘I can take you home now and then I’ll be gone. You’ve had an adventure no one will believe. 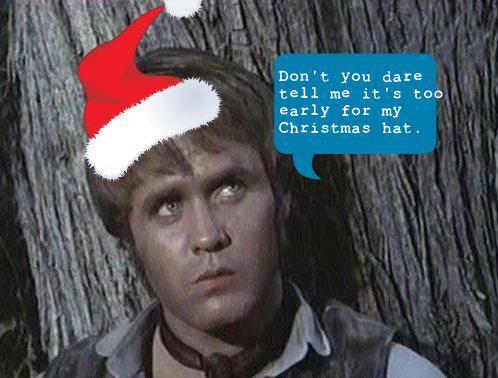 Big John asked St. Nick, ‘And what about you? With a wave and a whistle, the sled slowly rose. John’s magical journey had come to a close. The stockings were full for the bunkhouse boys, too. And there was, with Buck’s name, a brand new canoe. As he watched the sleigh rise, John felt a soft bunt. He then turned around to be met with a grunt. a champion beast and a real eyeful. ‘Grow that beef, Big John Cannon and make it the best.